Check out Tobi's Warm Nights Bell Sleeve Sweater Dress Summer nights are grand, but so are winter evenings when you've got the Black Warm Nights Bell Sleeve Sweater Dress on hand. We can't get enough of extra long sleeves you can bunch up for a slouchy look, and the mock neck that adds structure to this oversized sweater dress. Stay chic and bundle up! Summer nights are grand, but so are winter evenings when you've got the Wine Warm Nights Bell Sleeve Sweater Dress on hand. 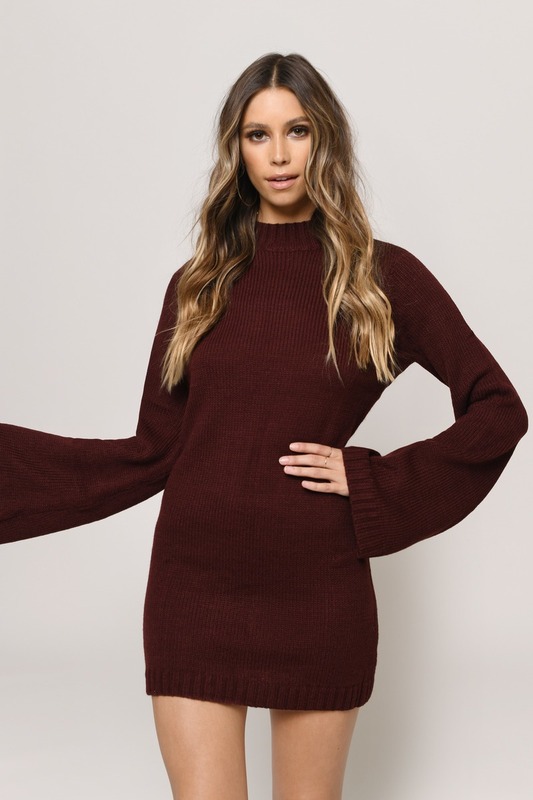 We can't get enough of extra long sleeves you can bunch up for a slouchy look, and the mock neck that adds structure to this oversized sweater dress. Stay chic and bundle up! Summer nights are grand, but so are winter evenings when you've got the Taupe Warm Nights Bell Sleeve Sweater Dress on hand. We can't get enough of extra long sleeves you can bunch up for a slouchy look, and the mock neck that adds structure to this oversized sweater dress. Stay chic and bundle up! Summer nights are grand, but so are winter evenings when you've got the Black Warm Nights Bell Sleeve Sweater Dress on hand. We can't get enough of extra long sleeves you can bunch up for a slouchy look, and the mock neck that adds structure to this oversized sweater dress. Stay chic and bundle up!